The story of this Italian Bride Ghost’s death is quite tragic and the events in the years that followed are quite mysterious, to say the least. 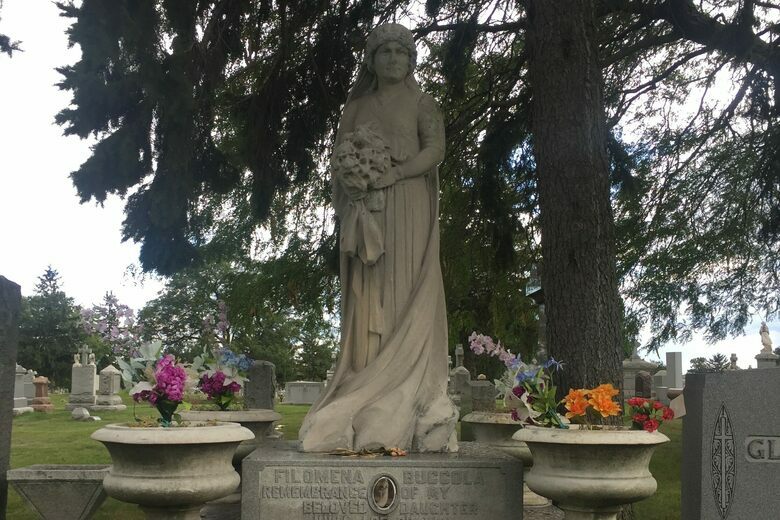 From her supposedly asking for her mother’s help by communicating through dreams, to having her body exhumed several years later, to the surprising state in which her body appeared, to the numerous reports of people seeing her ghost, it’s no doubt that Julia Petta is one of the most recognized names within the large cemetery. Julia Buccola Petta was born on June 6, 1891 in Italy. After her father George died in 1913, her mother Filomena immigrated to the United States with Julia. They relocated to Chicago to join Julia’s three other siblings who were already living there – Henry, Joseph, and Rosalia. In June of 1920, Julia got married to Matthew Petta at the Holy Rosary Church in Chicago. Not long after the wedding, she became pregnant; however, she had terrible complications with her pregnancy. On March 17, 1921, Julia suffered a high fever and died while giving birth to her son Filippo, who unfortunately was stillborn. Italian tradition dictates that if a woman dies while giving birth she is a type of martyr; therefore, Julia was buried all in white. In fact, she was buried in her wedding dress with her deceased baby tucked into her arms. They were both buried in the same coffin at Mount Carmel Cemetery in Hillside, Illinois. Not long after Julia was buried, her mother Filomena started having strange dreams where her dead daughter would beg her mother to exhume her grave. In fact, the distraught mother was convinced that her daughter was still alive and needed her help. A short while after having those disturbing dreams, Filomena went to the priest, local police, as well as the cemetery officials to ask them to have her daughter exhumed. After waiting an agonizing six years, she was finally granted permission to have Julia’s body exhumed. Then in 1927, Julia’s casket was dug out of the ground but nobody was prepared for the surprise that was awaiting them. Even though it had been six long years since Julia had been buried, when the lid of her casket was opened up, her body appeared exactly as it had looked when she was alive. While the body of her baby had decomposed, Julia’s body had not decayed at all. In fact, it is said that she just looked like she was sleeping. Her family and friends were convinced that this was a sign that Julia was now a saint. Many skeptics believe that the picture was taken prior to her burial; however, that doesn’t explain the poor condition that the casket was in, as well as the decomposed body of her baby. Another possible explanation is that of “corpse wax,” which consists of fatty acids and calcium soaps that are created during the decomposition process of dead body fat in moist conditions – basically it was preserved by a normal and natural process. Whatever the reason, it’s still a mystery that has yet to be explained – almost a century later. Another interesting fact is that on the grave, Julia’s married name Petta is missing but her maiden name Buccola is clearly visible. Some speculate that her mother Filomena never liked Julia’s husband Matthew and did not approve of the marriage. Many people have claimed to have seen Julia Petta’s ghost at Mount Carmel Cemetery. They say that a woman dressed in white wanders the cemetery during both the day and the night. For example, there’s a high school located near the cemetery, and many of the students who attend that school have seen a girl walking through the cemetery at night. In fact, in 1976, a Halloween dance at the school was shut down early because of a terrifying encounter with Julia’s ghost. The story goes that a car full of students was driving down the street when they noticed a girl walking through some of the tombstones. At that point they stopped the vehicle in order to get a better look. Initially they had thought that it was a Halloween prank but it didn’t take long before they realized that what they were seeing was in fact real. With the ghostly apparition around 30 feet away from the car, it was easy to see that she was completely dry even though it was pouring rain outside. One common report is that people witness strange objects floating at the cemetery. And numerous people have reported seeing Julia herself wandering around the location, especially near the administration building by the entrance of the cemetery. Some people who walk past this location at night see Julia wearing her wedding dress and it appears to glow. Others have reported seeing a bright light illuminate her gravesite. Another common report is that quite a few people have smelled the scent of tea roses at her gravesite. What’s even stranger is that when these people have smelled the tea roses it was in the winter when there were no more flowers at the cemetery. One well-known story is that of a young boy who got lost in the cemetery and when he finally found his parents, he told them that a nice, pretty lady in a wedding dress helped him find them.